Bring the Outback Indoors™ with Pre-finished ENGINEERED Australian flooring, our "Gondwana" Collection from a timeless land... ​Hardwoods USA (LLC) provides our discerning clients with unique, specialized engineered Australian hardwood flooring, including our Miss Australia: Australian Cypress, our Famous Aussie: Australian Spotted Gum, our Pacific Darling: Sydney Blue Gum, and our gorgeous Aussie Chocolate Zen: Australian Blackwood flooring. Minimum order 400 sq ft. Contact us to buy. Scroll down for enlargements & full details. ​Click here for Specs, finishes, widths, etc. Mastered to exacting standards, all our engineered Australian flooring is radiant heat compatible and CARB compliant. Along with the advantages of engineered boards, perhaps one of the greatest features for builders, contractors, and homeowners, is that our Gondwana collection is all wider boards of 5-1/4" and 7" widths for ease of installation and a sophisticated look. The finishes are polyurethane or oil. Australian Cypress - engineered. ©. Australian Cypress - engineered flooring, matte finish. A well-loved hardwood flooring favorite in both the USA and Australia. This flooring has gold through brown colors, highly figured grain, and plentiful dark knots. Minimum order: 400 sq ft.
Australian Blackwood engineered flooring - Chocolate Zen. ©. Australian Blackwood flooring - engineered, matte finish. Rich chocolate colors, superior hardness, beautiful rippled grain. 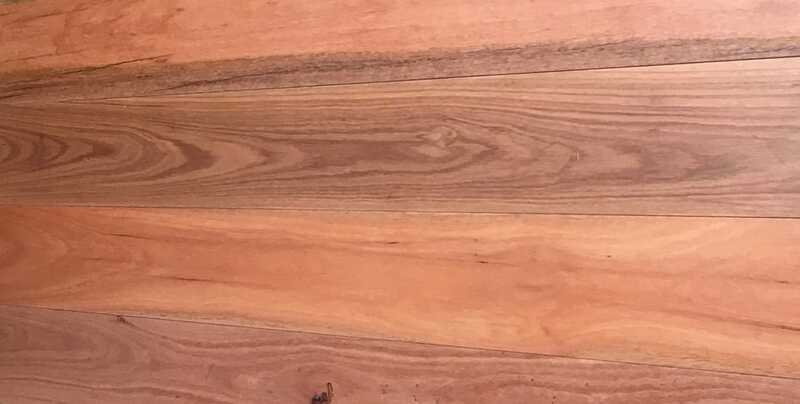 Minimum order: 400 sq ft.
​Illustrated at top of page: Australian Spotted Gum flooring.